We have had many announcements in our young company’s history, but none more exciting than this one. We have announced acceptance into the worldwide technology accelerator Techstars, the closing of a seed round in February, and working alongside the Associated General Contractors of Kansas, all as significant milestones for our company. All of these pale in comparison to having real customers buy-in in Grit’s mission to the point of becoming the First Adopters of Grit Virtual during our Limited Release. We are excited to announce our first five clients. McCownGordon Construction, Kansas City, Mo. These contractors have provided immensely valuable feedback and directly affected our product roadmap. They believe in Grit to the point that they are installing Grit as the construction scheduling solution on one or more projects in their portfolio to put it through its paces. For that, we have nothing to say but to offer a massive “THANK YOU!!!”. Both Key Construction and McCownGordon Construction assisted Grit through what we called “alpha testing”. We were able to track alongside active projects and compare them to the sequences that were being generated by our algorithms. Both contractors have seen the value to the extent to install on an upcoming project. Powerpoint decks, whiteboard diagrams, thousands of lines of code, and mocked up interfaces can only get you so far. At some point in time, you have to hand over the product to the users and put it to work. 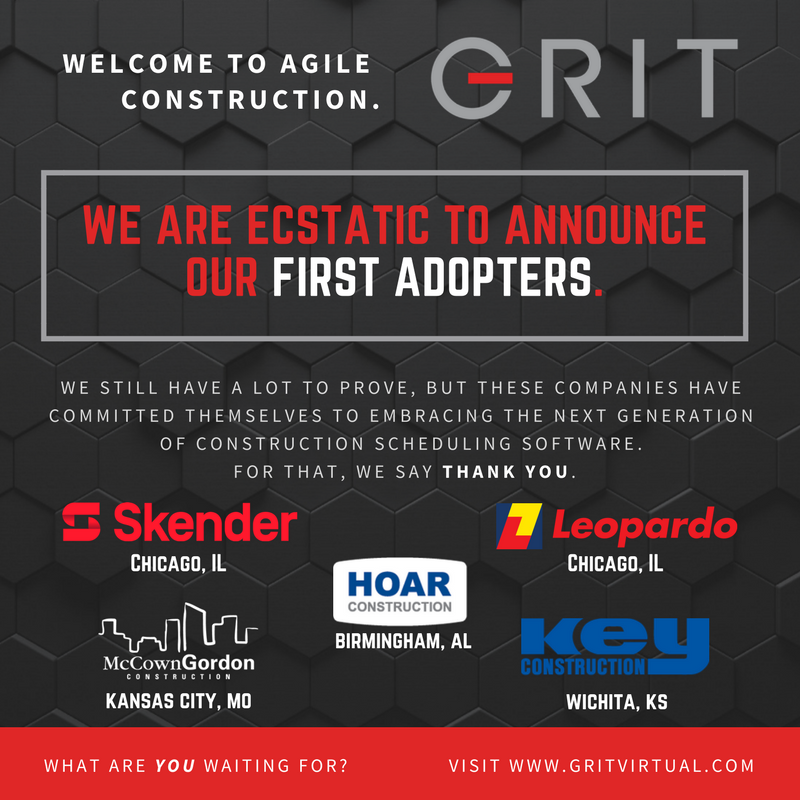 These five innovative companies will have the first say in which direction Grit develops and be the first to live in the age of Agile Construction. Ready to join the fun? We have limited spots remaining. Reach out to us at hello@gritvirtual.com or visit www.gritvirtual.com to learn more. Previous PostT-0: Our Team. The final and most important aspect of Grit.